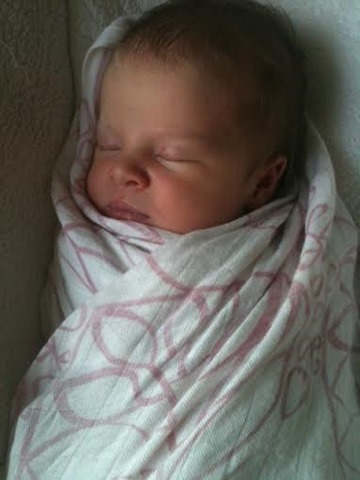 Zoe Ruth was born on December 3rd at 12:33pm, and weighed in at a chunkalicious 9.1 lbs. Zoe’s birth story – Part 1. 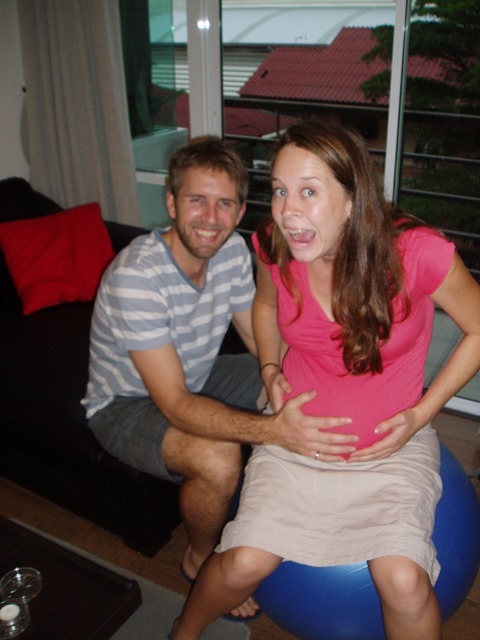 When I hit 10 days past my due date, my obstetrician told me that he wanted to induce labour. Induction was something that I had been dreading since I hit my due date. While I wouldn’t describe myself as being rigidly “natural,” I was looking forward to a natural birth experience. We had hired a doula, and I assumed that I would follow in my mother’s footsteps, and have a straightforward labour experience. While induction doesn’t preclude this, it does increase the possibility of medical interventions, which I didn’t want. My doctor wasn’t comfortable with letting my pregnancy continue, though, and told me that I would have to sign a form waiving him of any liability if I chose to keep waiting for labour to start by itself. 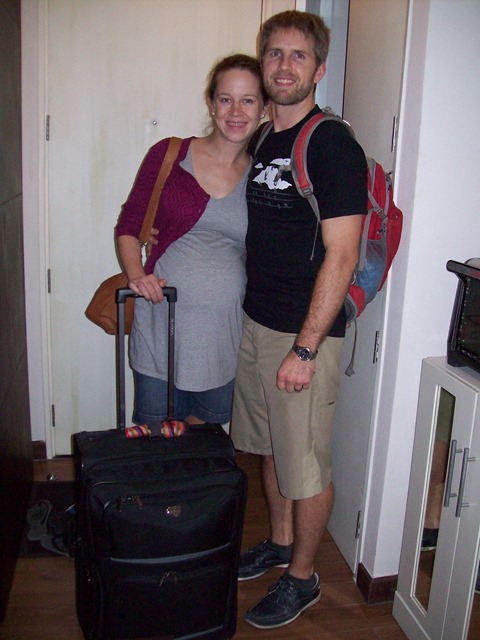 Todd and I weren’t prepared to ignore our doctor’s advice, and I was also starting to have serious doubts that Zoe would ever arrive on her own. So we checked into the hospital on Monday night to start the induction process. Getting ready to leave. When you’re overdue, you have time to add a ridiculous amount of extras to your hospital bag. I was given a low dose of hormones overnight, in the hopes that, at the very least, they would prepare my body for labour, and hopefully even trigger regular contractions. 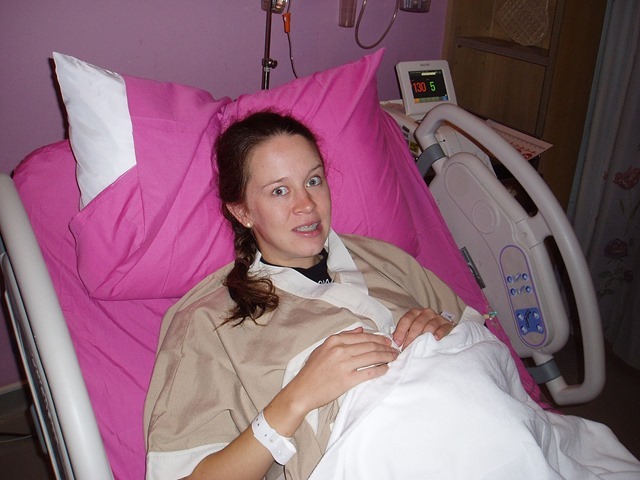 I had several random contractions that night, but nothing that indicated real labour was on its way. The next morning, I was hooked up to several monitors so that the nurses could observe my contractions as well as Zoe’s heart rate. After an hour of this, my doctor decided to start me on a Pitocin drip. Most women respond to the drug quickly, and it tends to trigger intense, regular contractions. 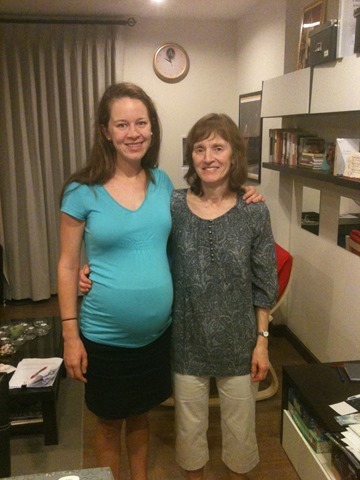 When our doula, Catherine, heard that we were about to start Pitocin, she got to the hospital as quickly as she could. I was nervous, but excited. 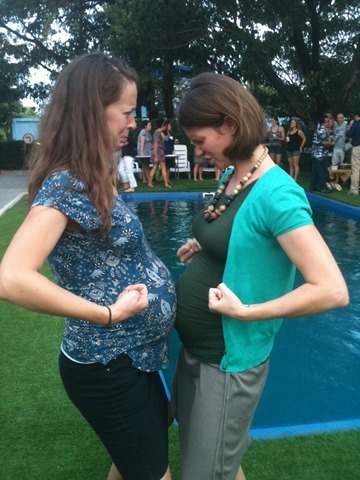 Finally, I would get to experience REAL contractions! (any woman who has given birth is probably rolling her eyes right now) After two hours of pleasant chit-chat with Todd and Catherine, interspersed with mild contractions, I was starting to wonder when things would actually get going. So were the nurses. When asked, I told them that my pain level was at a 3 or a 4. They responded with “We want you to be at a 10, ka.” Much as I wanted to believe that I have an exceptionally high pain tolerance, it was clear that something wasn’t working. And then Zoe’s heart rate dropped dramatically three times in a row, and I had an oxygen tube strapped to my face. Before we really knew what was going on, my doctor had arrived, and was recommending an immediate c-section. We were in shock by this point, but agreed to go ahead with the procedure. Waiting for the Pitocin to kick in. I don’t think surgery is ever pleasant, but trying to mentally prepare so suddenly for it was tough, especially when I was so scared for the safety of our baby. Fortunately, I had a great doctor standing by my head explaining each step of the procedure to me. I was given an epidural, and as it took effect, I lay there praying and telling myself to be strong. Before the surgeons began, Todd came in and held my hand. By this point, I was feeling so woozy that it was all I could do focus on one spot on the sheet hanging in front of my face. The surgeons pummelled my upper torso so hard that I thought my ribs would break, and through the numbness of the epidural, I could feel Zoe being squeezed down my torso. Before we knew it, we heard her first cries, and we both immediately started crying as well. That is my favourite memory of our birth experience – hearing our daughter for the first time. She was immediately taken to a table in a corner of the operating theatre to have her lungs vacuumed. I couldn’t see anything, but Todd described her to me as he watched the procedure. A nurse brought her to me, and pressed her against my cheek – I wasn’t able to move my arms. I was barely conscious at this point – the only thing I remember is thinking that she was beautiful. She was then taken to the nursery, and I told Todd to follow her. As soon as they were gone, I passed out. More to come when I get some sleep. Well, I can’t say that I was expecting to have to write the last post on being overdue, but I reeeally wasn’t expecting to write this one. At nine days overdue, my little rib-stomper is still frolicking to her heart’s content inside my innards. I know that wombs are generally warm and soothing environments, but mine must really be providing the ultimate resort experience. Much as I enjoy cracking jokes, the past two weeks have been a psychologically difficult time. Every day has felt like a bit of an emotional roller coaster – at times, I have coped pretty well, but at other times, I have been a full-on basket case. It’s like being a kid again and waiting for Christmas morning, but Christmas morning keeps getting indefinitely delayed. I know in my (semi) rational brain that Christmas WILL come, but at times, I forget. (To make a truly accurate analogy, I guess the eventual Christmas morning would need to begin with a few sledgehammer blows to the uterus before opening presents from Santa). Making the pedicurist nervous that I am about to give birth in the foot bath. We managed to waddle our way over to church yesterday, and were reminded that it is the first Sunday of the Advent season. On the way there, we were debating what the first Advent candle symbolized (different faith traditions follow different patterns). Turns out that at our church in Bangkok, it symbolizes waiting. One line from the bulletin jumped out at me: “Waiting is difficult. But when the object of our waiting is a treasure of great value, the waiting is worth it; the waiting is rewarded.” While the message was referring to the world waiting for a Messiah, I also felt like God was reminding me that He holds Bannock, the little over-baked bun, in His hands, and that I can trust Him with this whole crazy experience. She’ll arrive at the right time. Also my more-human, but less toothy Momalot, who arrived last Tuesday. Since she has no baby to cuddle, she has been forced to fill her time by cooking butter beef, and buying me ice cream. This is healthy pregnancy eating at its finest. 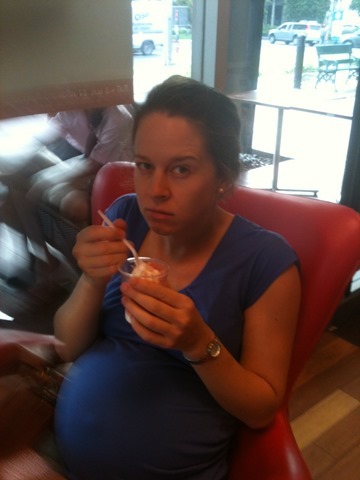 Todd and I spent my due date at the hospital. My doctor wanted to make sure that everything was still looking normal, so he prescribed a non-stress test for Bannock. Basically, I had a couple of monitors strapped to my impossibly large mid-section in an effort to determine whether Bannock was still moving normally. While I appreciated the diligence, I could have answered that question on my own: Bannock and her best friend Placenta are throwing a rager. 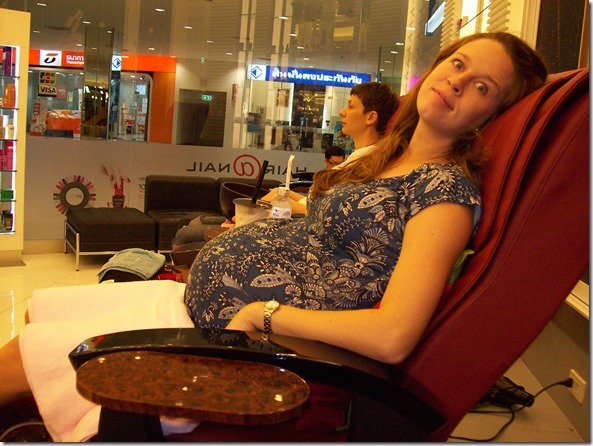 Only in Thailand do the birthing rooms and nurses look like they belong in a soothing spa. I took the test in the room that I will most likely be giving birth in. It was nice to get a feel for it in advance, but also an annoying reminder that we weren’t there for the actual event. 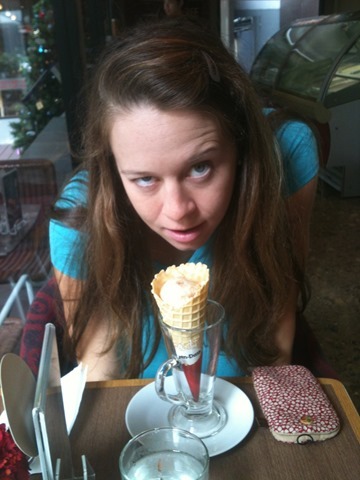 So I made Todd placate me with more ice cream. If you haven’t tried Haagen Dazs’s salted caramel flavour yet, do yourself a favour and buy some immediately. It may be trendy, but you won’t care once it’s in your mouth. The rest of my recent pre-child days have been filled with bad photo shoots, bouncing on my birthing ball, and giving Bannock lectures about the importance of respecting other people’s schedules. In the battle of the bulge, Bannock is clearly dominating. Ok. That’s probably enough whining, and more than enough revolting photographs of me. I’ll try to enjoy these last, fleeting moments of butter beef bliss, and start preparing the ultimate sermon on punctuality that I will preach to Bannock throughout her life. Did Aung San Suu Kyi Ever Go Outside? 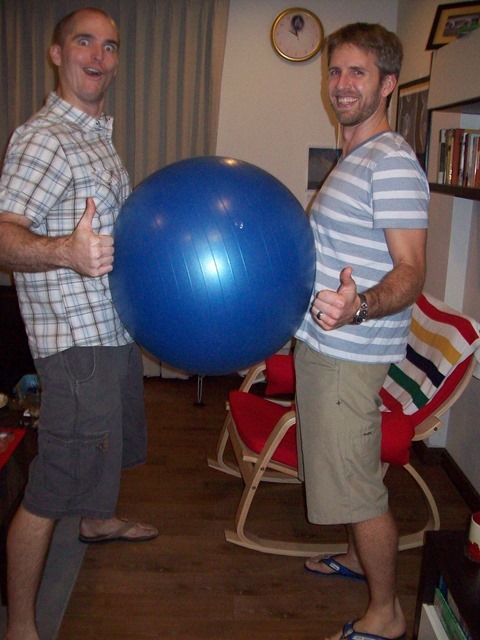 I'm a 20-something Canuck who recently moved to Bangkok with my long-suffering husband. I'll be chronicling our (mis)adventures as we eat, drink, and discover the meaning of life in this land of gastronomic perfection.